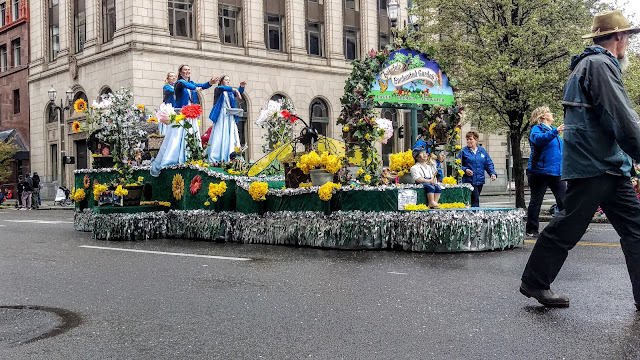 On Saturday, the predicted storm blew in early and heavy rain was coming in sideways as Tom set out to meet a friend to watch Tacoma's Daffodil Parade. I decided to stay home but just as the parade was about to begin, there was a break in the storm and the sun even made an appearance. Tom took the below pictures. "The Daffodil Festival originated in 1934 as a celebration of the agriculture industry in the Puyallup and Sumner area. The Daffodil Parade became an annual event where the community gathered, and the daffodil was the exalted symbol. 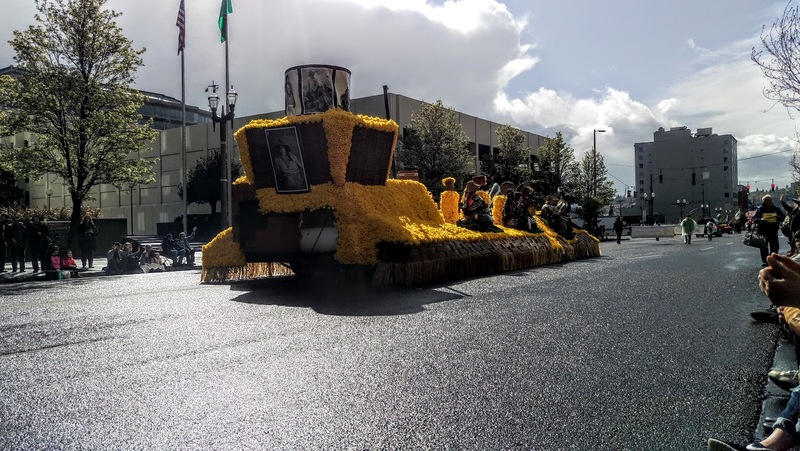 The celebration gradually grew to make its way through four Pierce County cities in a single day." Quotes are from the Daffodil Festival website. Bands from many schools were on hand. "Despite the loss of the daffodil farmers throughout the years, Pierce County is still fertile ground, continuing to sprout new ideas and ways of thinking, ingenuity, industry, and innovation. 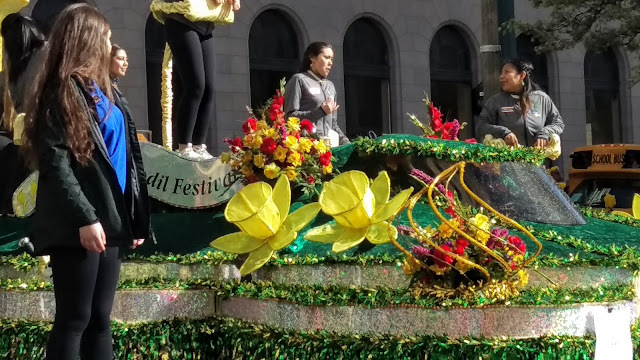 The parade still hosts the beautiful golden flowers, but the true celebration continues to revolve around the community from which it originates, and the people whose hands have built the festival from the very beginning. 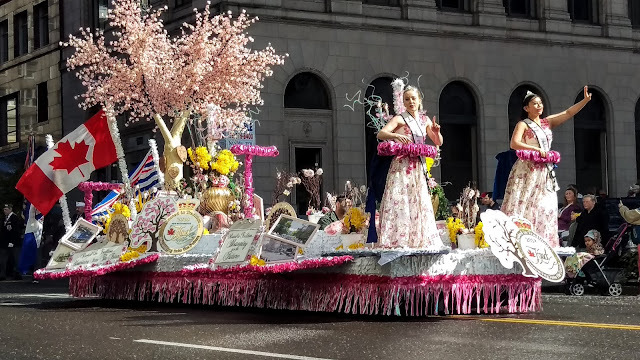 The high school bands, floats, businesses and local organizations, all hold strong ties to the streets they march, walk, and ride over in the parade. 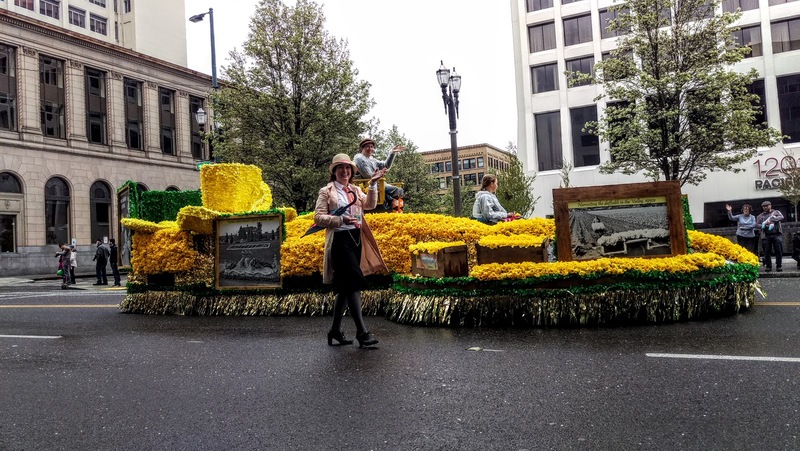 It is for this reason that the Daffodil Festival still flourishes." 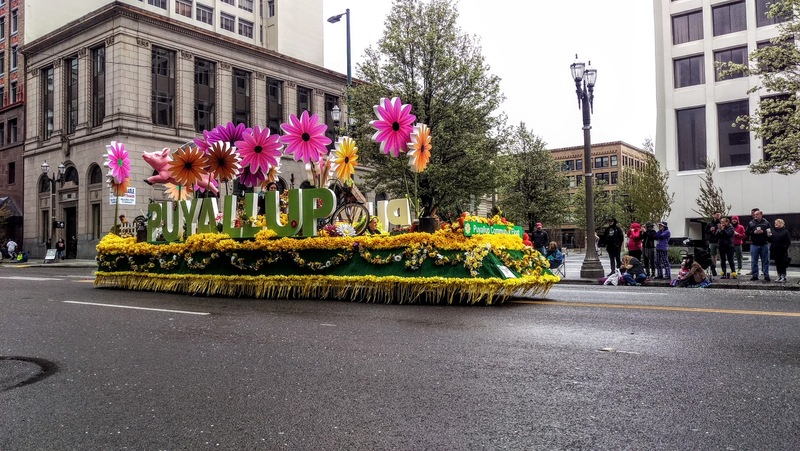 "This Festival thrives, when Pierce County is at its strongest; when the support and spirit of its diverse communities come together. When they share their talents, and take part in a grand tribute to the land they live in, magic happens. That’s the Parade, showcasing a community at its best." 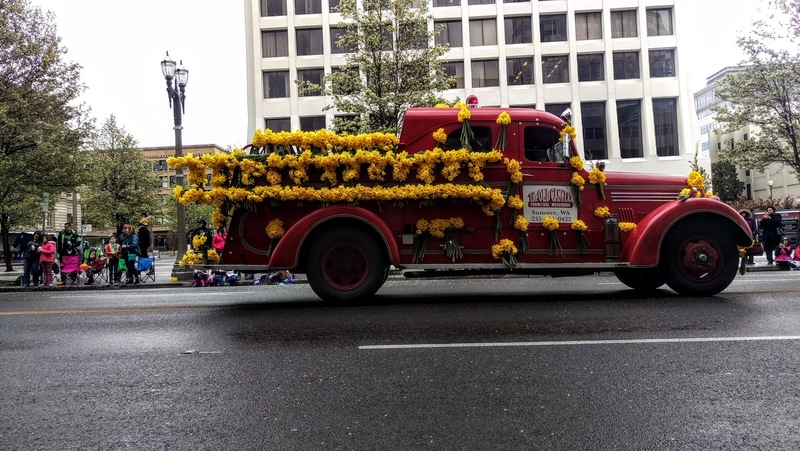 "Daffodils came to the Puyallup Valley around 1925 to replace the area’s dying hop industry. The U.S. Department of Agriculture recommended bulb growing because of the Valley’s excellent soil and ideal climate. About 200 varieties of Daffodils are grown, with the King Alfred being best known and most locally grown." 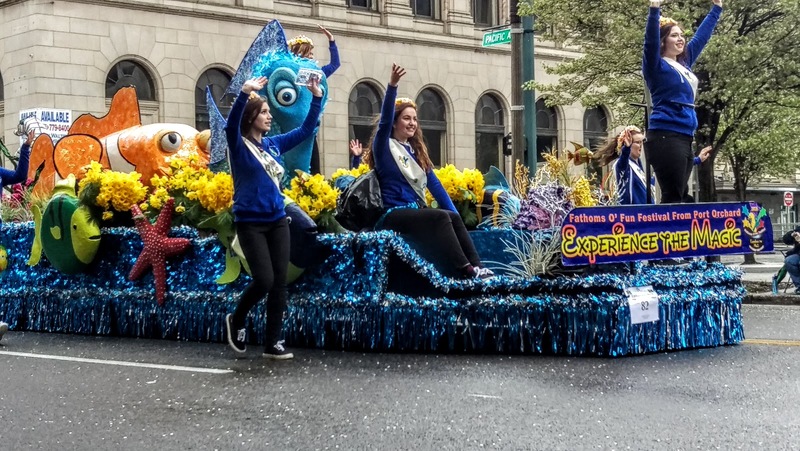 Each high school in Pierce County elects a daffodil princess and through some sort of contest, one is crowned queen of the festival. However, all of the princesses act as ambassadors of Pierce County and dedicate their year of royalty to community service. The royal court always wears daffodil yellow dresses but Tom didn't get a picture of them. You can see one here. 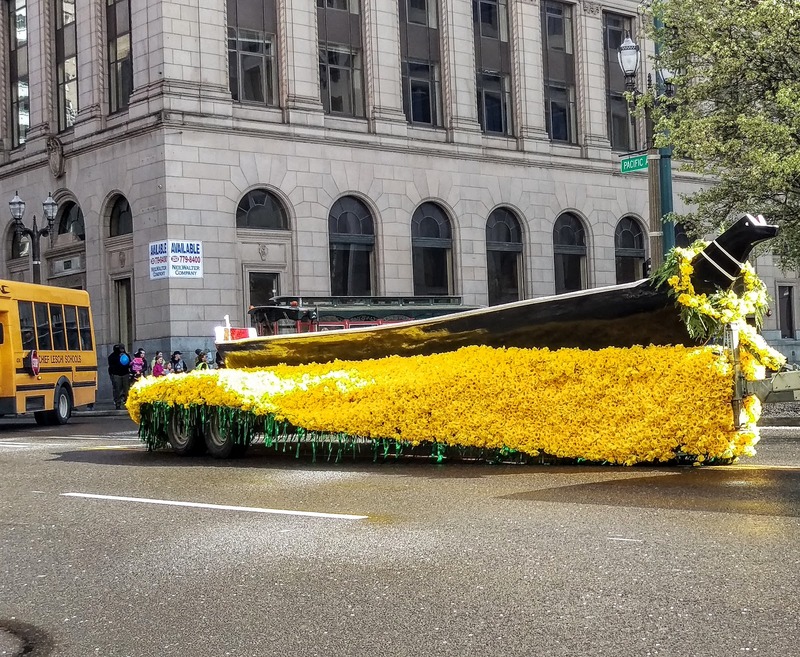 While in Portlandia they put a bird on it, in Pierce County, we put a daffodil on it. Oh how fun! Glad there was a break in the rain for the parade to happen. 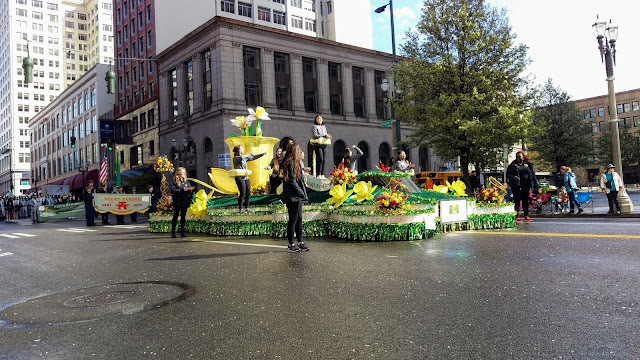 A Daffodil Parade, who knew? Thanks Tom! Love that red truck with the yellow daffy decor! What a treat to have my day start with a show tune -- the wonderful John Barrowman, no less! Lucky Tom that it wasn't Barbra Streisand singing Don't Rain on My Parade. Thanks for the pictures of the Daffodil Parade, I always miss it. Although they don't grow Daffs any more in that huge field you pass on the way to my house, in the spring, you can still see occasional yellow flowers in it from the bulbs that they missed. Any parade that celebrates flowers and plants is great in my view. Looks like fun! My grans would enjoy it! 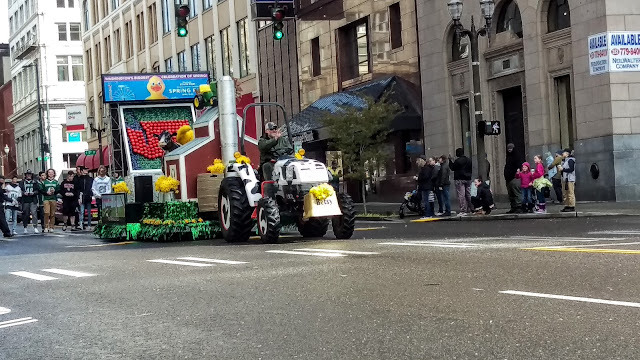 Those are some fancy floats. 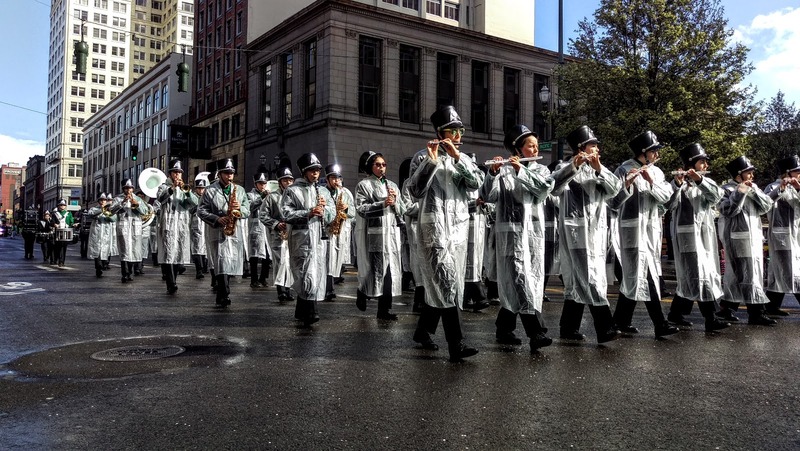 A parade isn't a parade without bands. It looks like it was a lot of fun despite the ify weather. We were going to go to the parade in Puyallup, for old time's sake for Tom, but we got scared out by the stormy weather. 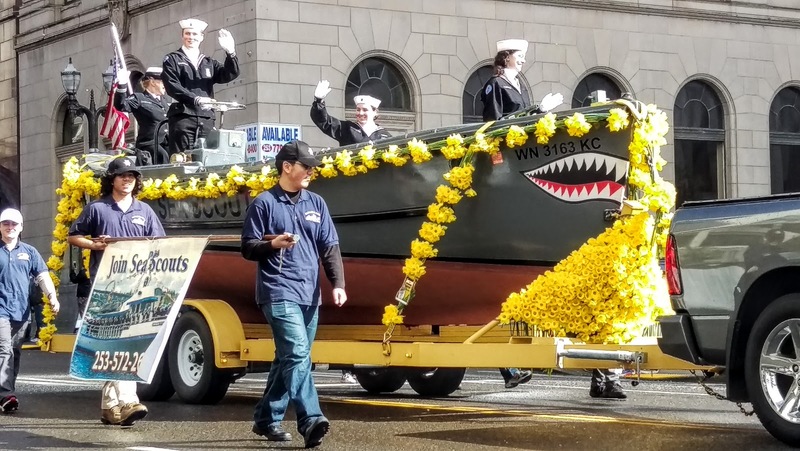 Thanks for posting parade photos! That's awesome! 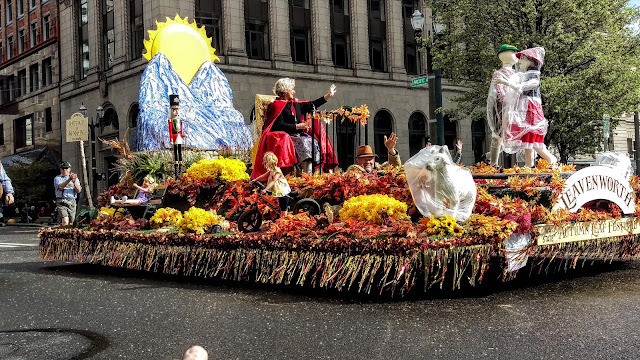 Reminds me of the Rose Parade in Pasadena, which I had the joy of seeing in person many years ago. The creativity with these parade floats is incredible! I love the idea of a Daffodil Parade. We don't have that here. Although if we did, this year would have been a bust.